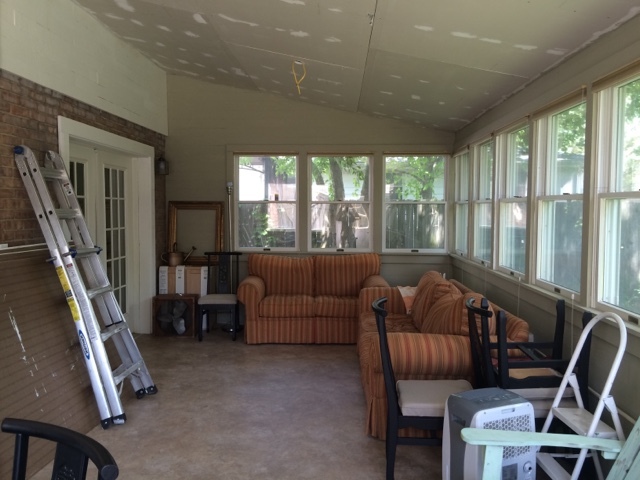 Before I show you the sunroom…..
I’ve been kinda slow to blog much. But I’m still truckin. I just finished a 13 week Griefshare class. That was really good for me -- entirely exhausting. But then that’s just grief -- so not the course’s fault. But that’s had me kinda just introspective and quiet. Because we switched churches, I’m joining more groups and classes, I’m making more friends, doing more stuff on occasion. That’s been refreshing. But yeah that took up a lot of time and energy, and I’m still not sure I’m done. But I know where I’m leaning. Choices are so nice, and yet so draining. I like to really look into things, so it get’s kinda crazy. I’m also attempting some thrift store clothes altering (Our weather has been crazy. The other day in April it was in the 80s. So I ran and got a bunch of “I’m too hot” clothes. Only to have it go back into the 50s so that I’m back in my winter sweaters this week. But that’s ok, because it gives me time to work on my projects. )…I’m hoping I get a summer jumpsuit out of the mix -- but time will tell if I succeed. I don’t know what I’m doing, I just have my fingers crossed. I’ve been reading like crazy. I have more books than makes me feel sane from the library. I have grab-5-books-from-around-the-one-I-wanted disease. I can’t read everything I think I should. But I am trying. I’m also trying to get back to working out. This month is the month. I’ve let stuff slide too long. But now I’ve gotten through griefshare, I’ve got more stuff in the house settled. It’s time. I miss feeling as fit as I did last summer. This is close to when I started last year -- so it’s kinda like a total do-over, only with less to lose. I put a bit back on, so there’s a bit to lose. But nothing major, I just miss feeling so vital and just good-feeling physically. I gotta get back on the train. I also have to fix my brain about it. If anyone wants to comment about this -- PLEASE DO. But I have this really backwards struggle….I think that when I get fit, I’m mean to people. I have a hard time separating people’s personal emotional response to it, from my own responsibility. Like when I lost weight last year, if anyone acted jealous, backhanded, or insecure around me, I felt like I was personally mean to that person -- just by walking into the room (thinner.) 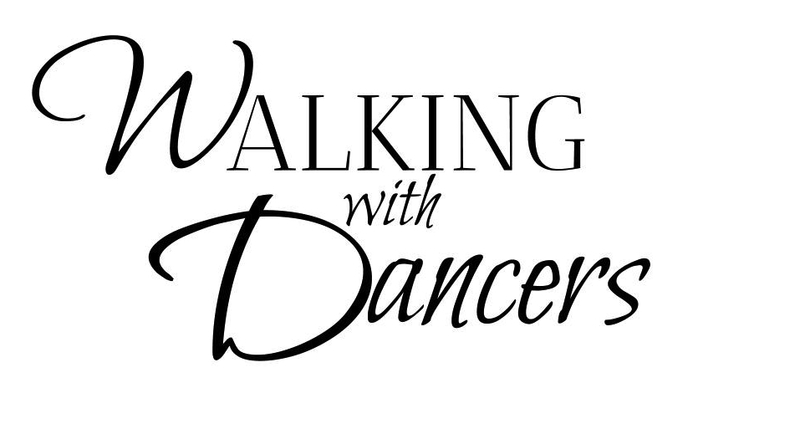 I’m working on it. I keep being told I am not responsible for other people’s emotions, only my own. (Because I’m SO not flaunting anything, or doing this for anyone other than me.) But this is a major uphill mental battle for me. So feel free to share any thoughts you may have -- I’m needing all the help I can get. It’s honestly a major part of why I put a few pounds back on, this stupid mental game. 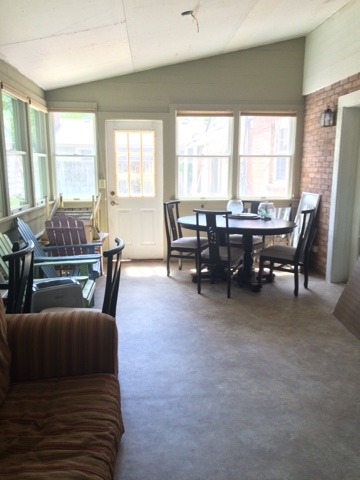 I’m not expecting to impress with these quicky iphone photos, but here’s a glimpse of our sunroom progress. And the nice thing about moving at the pace of a turtle in this space is, I literally got to see this color’s paint chip play with each season’s light. So I know I like this color in the sun, rain, fog, snow…you name it. I like that in the winter it feels warmer and in the summer it feels cooler. The room isn’t air conditioned, and we don’t normally heat it with it’s electric heaters. So having a color add the right mental temperature to the space is really helpful. Here you can see it butted up against the white primer. White was perfectly acceptable, and to some, likely preferable. But for me, the white was too strong in here. It called attention to itself. And I wanted this space to feel like it almost didn’t exist -- like I was outside, inside. I wanted the walls to disappear, not get attention. And for me, this color is it! The bees knees, the cat’s meow. I’m thrilled with it. Its a magic color, sometimes I still think the walls are white (when I’m not seeing the still white wall.) But other times it’s green, other times it’s tan, other times it grey. The green varies in depths and darkness. It plays wonderfully with the brick, the white-almond-bleh of the electric heaters, the kinda yellow-khaki of the shades this room came with….and most importantly the trees and grass and nature outside these windows. So here’s the deal with the white wall -- we are making sure we have the roof sealed enough before I paint it, and before the ceiling goes on. 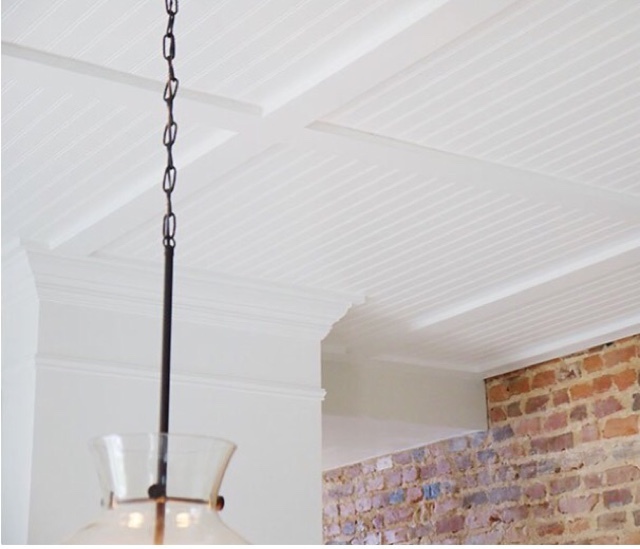 I’ve change my mind about the ceiling, and now I want to copy this technique I saw done by Lowe’s Spring Challenge Bloggers. Only of course mine will be angled with the vaulted-ness. Only I want to paint mine the wall color like these two spaces have done. 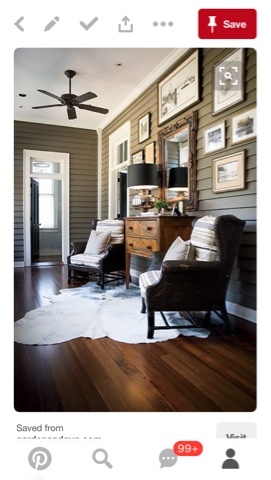 I can’t imagine the white ceiling working for my outdoors-inside schemes. Especially with the vault coming down -- it calls a lot of attention to the ceiling then. But I would like to get a fan similar to this one below. Simple, dark-tone. But will need a light source. Ok so let’s talk furniture. 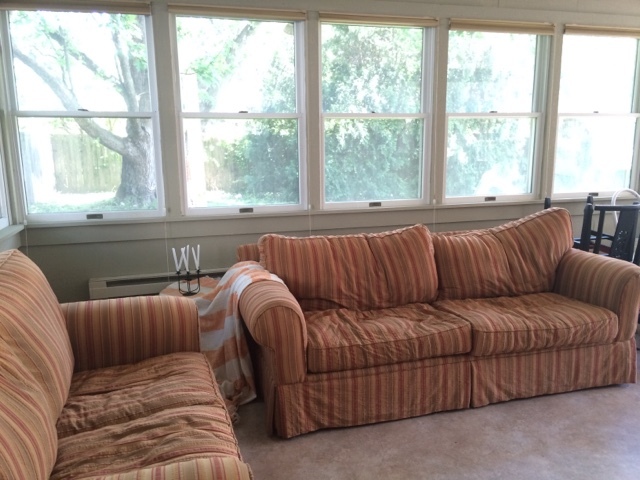 I got this couch and love seat off craigslist for $100 total, for both. They are very comfortable. And to be honest... I don’t hate the color. My goal is to sew them a neutral “pottery barn” like cover. But I’m not mad at them, so I won’t rush. Off to the side, stacked up messy, I have my patio chairs still waiting for paint. I wound up choosing a soft black. I think it’s going to be very chic. But I really like it out here. It’s a great spot for it. I still need to choose a new door. This one is the really bad-seal one. (I wanted to paint it olive grey too -- but decided to save my paint for the real thing.) I can’t decide on a style for here. Same thing? 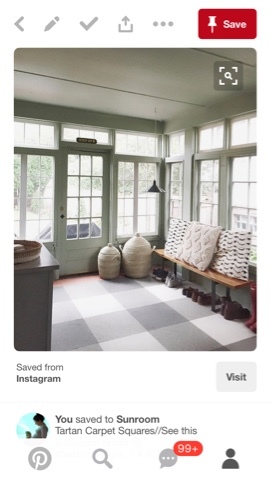 Or instead, a window floor to ceiling? (Panes/no panes?) 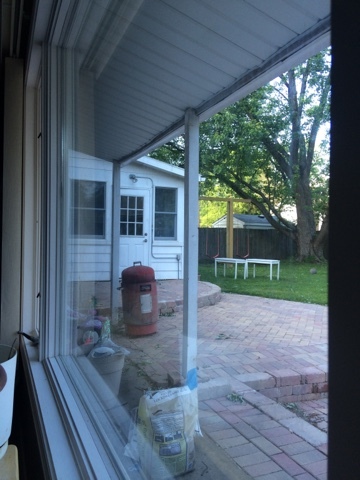 Zero window -- solid door? (Panels, one panel, flat?) What does this room ask for? I wish I could hear it speaking better. 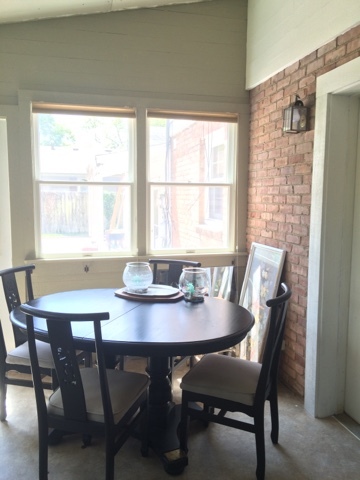 I will also see the outside of the door from my family room. So I’d like it to fit the whole house vibe. Wow -- our smoker’s gorgeous! Ignore that and the bag of…sand? Just look at the door over the patio step. You guys have any thoughts on the door? Comment away. I’m stumped. But it’s gotta happen. Here’s a pano. (it makes the room bigger than it really is -- but it is a big room.) I’m so excited for when this whole room is done -- soft green and quite, or loud with rain. It’s going to be so beautiful. I think it’s going to be my favorite room of the house. I want to encourage you, and don't have the words. Your grief- I've never been through something like that, so I can't even relate. And the weight loss- I've done that before and need to get on it again now that I am 1 year post-baby. I don't remember people being negative about it. I can only encourage you, and remind you how good it feels when you feel fit and strong and don't have to search your closet every day for something that is not too tight and doesn't show the pudge! And how much less time it then takes to get ready, and how much of a better mood you are for hubby and kids! And I do have an opinion on the door. Maybe not style (although I do think you need one with some kind of window). I'd suggest you don't paint it the same as your walls. At a minimum, go with a darker or lighter shade than the walls, but also consider something bright- green or yellow perhaps? P..S, I really do like the way the color of the walls work with the brick and the trees- you definitely picked the right color for that. Yeah I don't know what the deal was, but I had a lot of people treat me strangely last year when I lost the weight. It was all pregnancy weight, but it took me so long to lose it I think it started seeming like my normal, so then it seemed like a big deal. But Honestly, I was so sad at that point that it was really hard to even deal with compliments on my outward self, lead alone random weirdness. I guess it let it affect me too much. But you are right-- I'm trying really hard to focus on all the things you mentioned. I've been doing good this week at my work outs and I'm already feeling my muscles thanking me. I'm trying to keep my focus there. Thanks for all your kind thoughts!! I'm glad to hear you like the Olive grey too! On the weight/fitness issue: I've been getting back into it myself and while I don't need to loose weight I need to tone badly- like I'm gonna get hurt if I don't my muscles are so weak! I know some people in my life have a lot of weight to loose and might think that I don't need to bother but my motivation is my daughter. I want to be fit enough to run and play and swing her around. I guess if people's thoughts/comments are challenging try to focus on what your children might be thinking or feeling. I'm sure they love it when you have the energy and strength to engage them in their play world. Let their thoughts ( which are always positive because you are super-mom to them) uplift you and give you motivation- you can do it! great design, it's look so awesome. i like all of this .. I'm a naturally smaller person, but I also put a lot of effort into eating well and working out. All my life I have gotten comments from people about my size. Most are more backhanded than positive. I've learned though, that the comments are really more about their own insecurities than they are me. I usually try to change the subject and not get hung up on it too much, but I do hate when the subject comes up. I know what you mean about being discouraged. I have often felt guilty about it myself, especially because I have several close friends whose medical issues make weight loss difficult if not next to impossible. I'm rambling a bit, but I wanted you to know that 1.) you aren't alone in feeling that way 2.) your real friends will love you in any shape 3.) when people are hurtful about you getting healthy, try to remember that you DESERVE to be your healthiest self, and your family deserves it too.